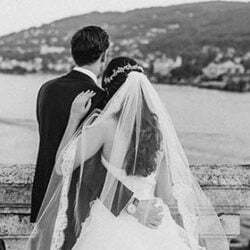 Looking for an original Italian touch your wedding? A sweet idea is the right choice! uring a wedding planning many couples ask me to add a little touch of Italian tradition for wedding gifts, favors for guests or maybe for the after dinner party. 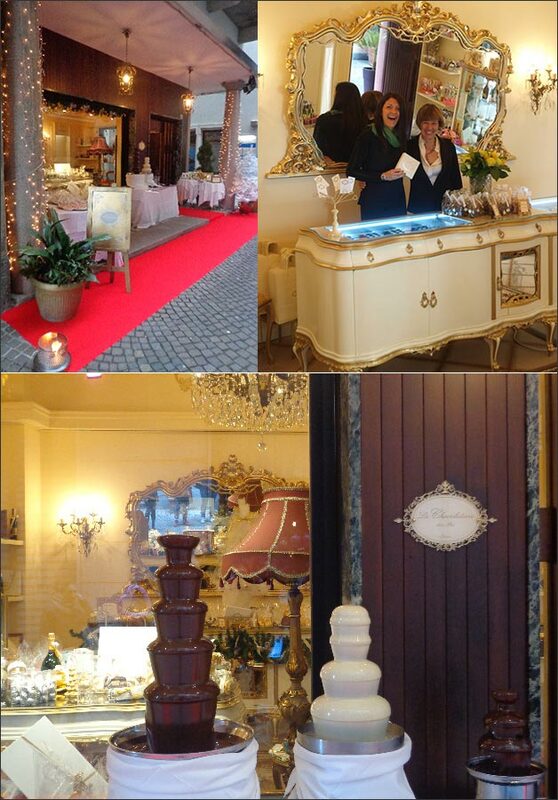 We planned many different options such as liquor bottles, chocolates, candies, boxes, bags… but I’m pleased to present here some wonderful options all coming from a special shop located in Stresa: Chocolaterie des Iles . Angelica, the lovely owner will welcome us in a magic sweet world! Chocolaterie des Iles is a lovely little shop in the very centre of Stresa. Inside you can find a wide choice of chocolate, biscuits, favors, bags, boxes that could be ideal for little touches to your wedding. All is home made in Stresa and all is made with original Italian products and materials. Gianduiottos are the traditional Piemonte chocolates. They can be personalized with your name and wedding date! An original idea that you could use as names card or favor in little bags or boxes! 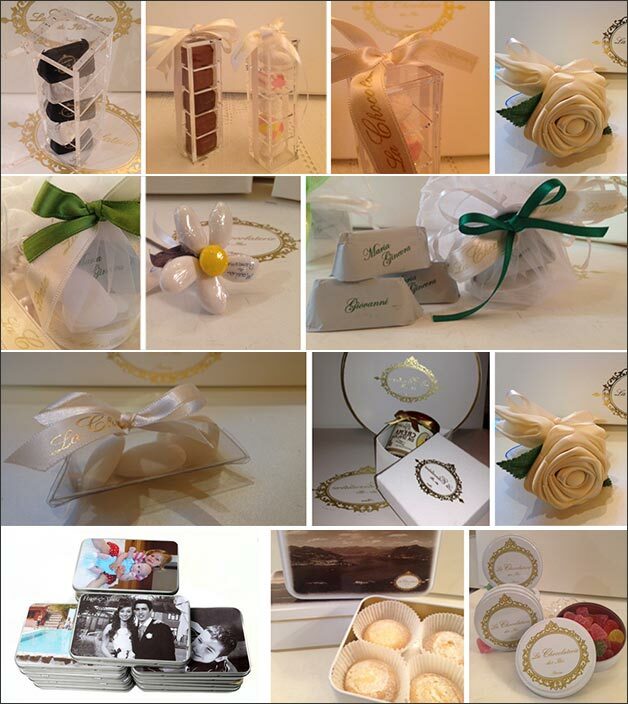 Chocolaterie des Iles can suggest fun wedding favors in paper boxes or tin boxes with your favorite photo, image or words! You could also find classical silk, cotton, laces or organza little bags in different sizes with satin ribbons. 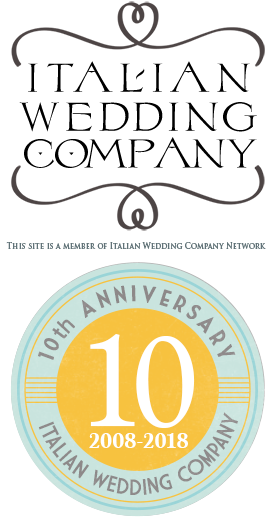 Inside them we could place classical Italian sugared almonds or other Italian products: from olive oil to wines, liquors and creams or any other object you wish. 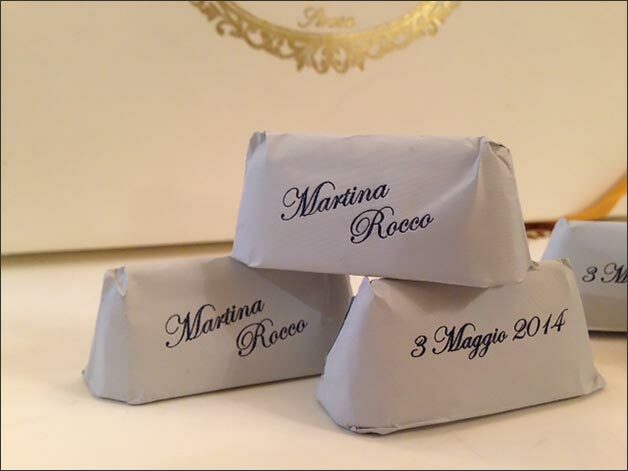 Sugared almonds are traditional in all Italian weddings! 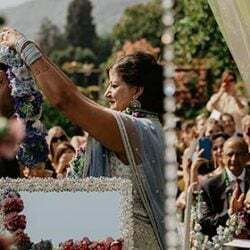 It is a way to thank guests for being with you on your special day. 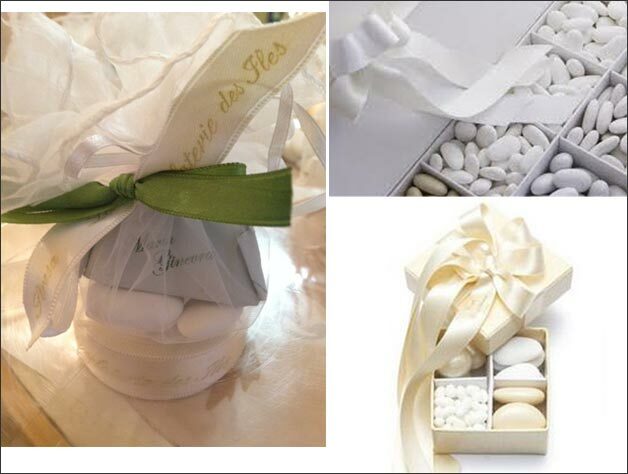 For your wedding on Italian Lakes Chocolaterie des Iles suggest us Pelino sugared almonds in 25 different flavors and colors to arrange a very special tasting experience for all your guests. 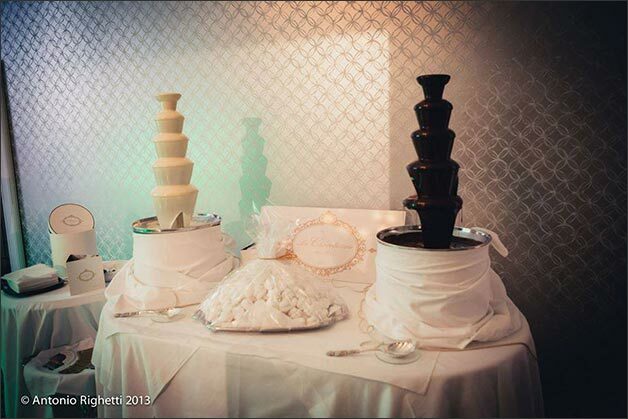 At the end of your dinner you could plan a lovely sweet or dessert buffet but you could also plan a delicious chocolate fountain with fondant, milk or white chocolate. You and your guests could have fun dipping fruit, biscuits or home made pralines. 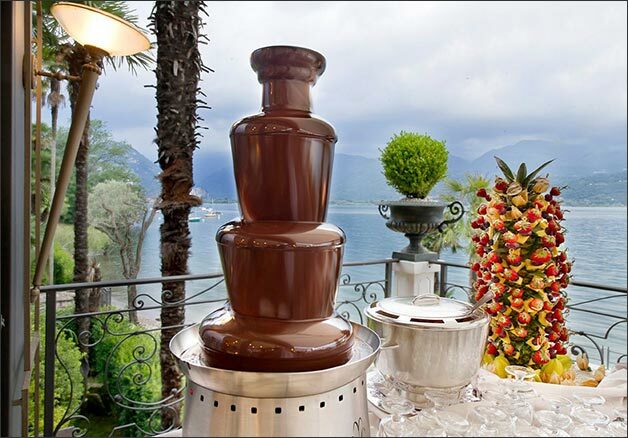 Chocolate fountains can be placed by your wedding cake or presented as sweet surprise during the dances! Chocolaterie des Iles owns and rents a very special Ice Cream Cart. It is a Piaggio Tuk Tuk (Ape Calessino in Italian) with a fridge ready to be placed wherever you want. 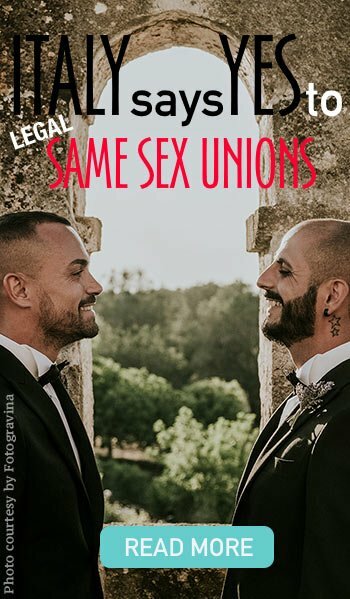 Imagine it at the exit of the church or the town hall, right after the ceremony. 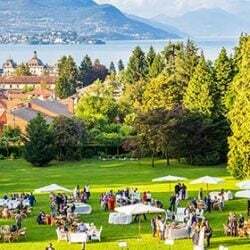 Or directly to the reception venue at the aperitif or after dinner during the dances. Roberto is Chocolaterie des Iles’ Ice Cream maker and he will be happy to make and serve you the real Italian gelato in cones or cups. Ice Cream Cart can carry on also a Chocolate fountain! Tuk tuk without fridge can be also rented separately as mean of transport. What a fun way to arrive to your ceremony or reception venue! It can be rented with its driver. It is fine and elegant with leather seats and wood details. It can be perfect for Italian style photos and take bride and groom for an original ride! 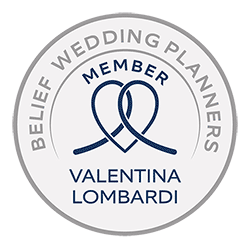 So aren’t you excited to choose together the right Italian wedding favor or Italian special touch for your party? Angelica and I will be pleased to guide you in this sweet world!